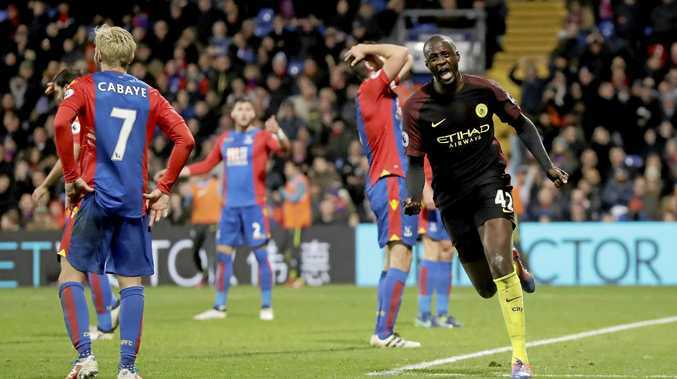 FOOTBALL: After a public apology to manager Pep Guardiola, Yaya Toure has celebrated his return to Manchester City's ranks with both goals in the 2-1 win at Crystal Palace. City is now on top of the Premier League alongside Liverpool, which had a goalless draw at Southampton. Resting key players before the Champions League clash with Borussia Moenchengladbach on Wednesday, Guardiola brought Toure in for his first English Premier League appearance of the season. Toure apologised to Guardiola for "misunderstandings of the past”. His agent Dimitri Seluk had been critical of Guardiola, accusing him of "humiliating” Toure by omitting him from City's Champions League group stage squad. The Ivorian repaid Guardiola's faith with a 39th-minute run and shot and, after Connor Wickham had equalised in the second half, netted an 83rd-minute winner. "I was prepared mentally ... I knew that one day my manager would need me,” Toure said. Manchester United manager Jose Mourinho complained his side was "the unluckiest team in the Premier League” after Arsenal snatched a 1-1 draw with an 89th-minute equaliser at Old Trafford. Juan Mata had put United ahead in the second half, but a last-gasp header from substitute Olivier Giroud earned Arsenal a barely deserved point. Mourinho has faced Manchester City, Liverpool, Chelsea and Arsenal in the league this season and not recorded a win.